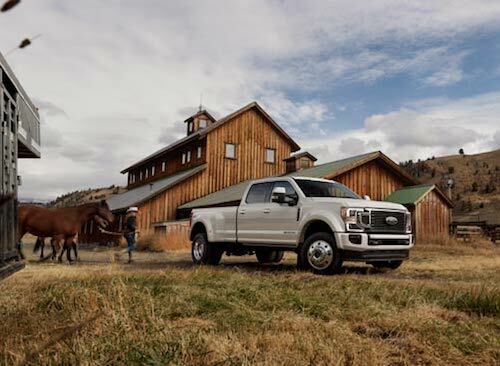 Capistrano Ford offers the complete lineup of tough Ford Super Duty trucks in San Juan Capistrano, CA. We have a wide selection of new Ford Super Duty F-250, F-350, F-450, F-550 and F-650 trucks to choose from in stock now. Known for their remarkable power, capability and advanced technology, Ford Super Duty trucks are built to push the limits of hauling, towing and off-road travel. New F-Series Super Duty trucks are available with a variety of Regular Cab, SuperCab and Crew Cab body configurations as well as with a choice of engine type. New Super Duty truck customers can choose between the standard 6.2-liter gasoline V8 engine, the Ford-built 7.3-liter V8 gasoline engine or the third-generation Ford 6.7-liter Power Stroke® diesel V8 engine. A wide selection of trim options including, XL, XLT, Lariat, Platinum and King Ranch® also exist for these sturdy work trucks. Explore our inventory of Ford Super Duty trucks for sale or lease near you. You will find our best deals on new or used Ford Super Duty F-Series trucks in San Juan Capistrano with our special offers and lease deals available now. Our Ford financing department will explain your options for buying or leasing a Ford Super Duty truck in San Juan Capistrano, CA. We offer a variety of affordable auto financing plans and can help you buy a truck with a low down and affordable monthly payments. Visit our nearby Ford dealership to learn more about new and used Ford Super Duty trucks for sale in San Juan Capistrano, CA.